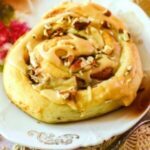 Big, fluffy homemade cinnamon rolls with toasted pecans and a thick, gooey icing - they rise overnight in the refrigerator so they're perfect for weekends! Mix warm (110F) water and sugar; stir in yeast. Set the mixture aside for a few minutes until it begins to bubble. I know this is no longer necessary but I think it still gives better results. Mix about 2 cups of the flour, salt, eggs, and buttermilk into the yeast mixture until smooth. Slowly add more flour until a soft dough is formed. You can do this by hand or with a heavy duty mixture and a dough hook. Once the dough holds together turn it out on a floured surface. Knead a few minutes until smooth and satiny, but still somewhat soft. It will feel like your earlobe if you pinch it. Let rise for 1 hour, or until double, if you have time. If not skip this and go on to the next instruction. Punch dough down; let rest for 5 minutes. This gets some of the elasticity out and makes it easier to roll. Roll the dough out into a rectangle that is about 1/2 inch thick or a little more. Spread the dough with 1/4 cup of the melted butter. Mix the remaining 1/4 cup of melted butter, cinnamon, and brown sugar together. Spread this over the dough and sprinkle with the pecans pressing in lightly. Roll up as for a jelly roll and cut in 12 thick slices. Refrigerate overnight. You can also just let them rise for about an hour if you want to bake them immediately but they aren't as good. Bake in a 375F oven about 35 minutes or until done. Watch carefully because the sugar will make the bottoms burn if you are not careful. While the rolls are baking mix the topping ingredients together. *Add 8 hours overnight time to the rising time if you'll let them rise overnight. For smaller rolls roll out a larger rectangle and cut into 24 rolls - half the calories. **To toast pecans place them on a heavy cookie sheet in a 350F oven for about 5 to 10 minutes stirring every minute or two until toasted. Watch that they don't burn!